Julie J. Ingersoll, Building God’s Kingdom: Inside the World of Christian Reconstruction (Oxford 2015). For the last several decades, at the far fringes of American evangelical Christianity has stood an intellectual movement known as Christian Reconstruction. The proponents of this movement embrace a radical position: that all of life should be brought under the authority of biblical law as it is contained in both the Old and New Testaments. They challenge the legitimacy of democracy, argue that slavery is biblically justifiable, and support the death penalty for all manner of “crimes” described in the Bible including homosexuality, adultery, and Sabbath-breaking. But, as Julie Ingersoll shows in this fascinating new book, this “Biblical Worldview” shapes their views not only on political issues, but on everything from private property and economic policy to history and literature. Holding that the Bible provides a coherent, internally consistent, and all-encompassing worldview, they seek to remake the entirety of society–church, state, family, economy–along biblical lines. Tracing the movement from its mid-twentieth-century origins in the writings of theologian and philosopher R.J. Rushdoony to its present-day sites of influence, including the Christian Home School movement, advocacy for the teaching of creationism, and the development and rise of the Tea Party, Ingersoll illustrates how Reconstructionists have broadly and subtly shaped conservative American Protestantism over the course of the late-twentieth and early-twenty-first centuries. Drawing on interviews with Reconstructionists themselves as well as extensive research in Reconstructionist publications, Building God’s Kingdom offers the most complete and balanced portrait to date of this enigmatic segment of the Christian Right. 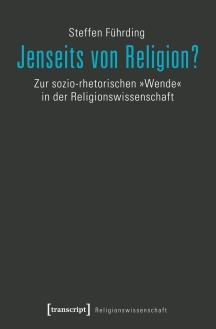 Books of Interest: Jenseits von Religion? Steffen Führding, Jenseits von Religion? : Zur sozio-rhetorischen “Wende” in der Religionswissenschaft (Transcript 2015). Seit mehr als 40 Jahren drehen sich viele Diskussionen in der Religionswissenschaft um eine genaue Ortsbestimmung der Disziplin in Abgrenzung zu anderen religionsbezogenen Fächern. Mit einem in Anlehnung an den nordamerikanischen Religionswissenschaftler Russell T. McCutcheon »sozio-rhetorisch« genannten Ansatz stellt Steffen Führding eine aktuell kontrovers diskutierte Position in dieser internationalen Debatte vor. Er verortet den Ansatz kontrastierend in der nordamerikanischen und europäischen Disziplingeschichte, wendet ihn exemplarisch an und zeigt Perspektiven auf, wie damit theorie- und methodikbezogene Herausforderungen in der Religionswissenschaft produktiv angegangen werden können. The Department of Literature and Philosophy in the College of Liberal Arts and Social Sciences invites nominations and applications for the position of Department Chair at the rank of Associate or Full Professor. Reporting to the Dean of the College of Liberal Arts and Social Sciences, the position of Department Chair requires vision, leadership, administrative talents, teaching (two courses per year), research, and service, as well as a terminal degree. The Chair will work in a collaborative department administrative structure, representing 24 full-time faculty members. The position is a tenured or tenure-track, 12-month appointment, and the salary is competitive and commensurate with qualifications and experience.